Thank you for spending time with us in 2014! It seems January could not come fast enough for us this year, symbolizing a much-needed fresh start, as we struggled to move past the challenges of 2014. We once again said reluctant goodbyes to guests who bravely fought battles against disease and lost… and hearts grew heavier, as three of us experienced the loss of immediate family members – all taken too soon. With mixed emotions, we bid farewell to three team members…spa attendant Diane, who followed her husband to Alberta for his new job; veteran esthetician Jackie, who will remain a full-time mom for the foreseeable future; RMT Mikaela, now practicing at a clinic in Delta. We celebrated our 10th year in business (honestly, where does the time go?) with a birthday bash…Our Raintree teas experienced an off-site following thanks to Sweet Spot Bakery… We welcomed new staff members to the Raintree team – Nancy, esthetician & massage practitioner (read on for her latest resume addition); Maggie, esthetician (with 15 years experience in the industry); Laura, holistic nutritionist…and the much-anticipated return of Lisa from Maternity Leave. As a result, appointment options expanded significantly (even Saturdays have opened up again)! We changed some treatment rooms around, added new services and shook things up a bit at Christmas. Thank you to all those gift card purchasers who took our “online only” purchase policy in stride and embraced their inner “techie”. Your support is greatly appreciated, especially by our spa visitors who enjoyed a serene atmosphere in December…We launched online shopping for our spa products and teas, enabling guests to shop from the comfort of home or office (on lunch breaks only, of course). 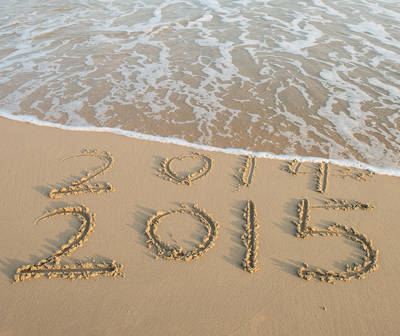 So what lies ahead for 2015? Lots of great things! Laurie and Pam attended a [comfort zone] conference in Italy this past year – and that means new products and treatments on the horizon, one of which (spoiler alert) involves mud…Nancy traveled to Beijing to study the art of Lash Extensions, a service launching this February that many guests have requested (especially cancer survivors)…Shannon continues her Aromatherapy studies, now offering personalized, educational sessions that focus on blending essential oils for better health… Stephanie is back one Sunday per month, providing permanent makeup services for those of us who need brow and eyeliner enhancements (and can’t be bothered to fill and line after every sport or water activity)… Plus new and annual events to look forward to, including our Spring Fling, White Party, Fall Fair and Glitter & Glam. All this would not be possible without your continued support and loyalty. Our sincere thanks for spending time with us in 2014. We look forward to helping you recharge mind, body and spirit in 2015.